Here's a list of this year's five Hugo nominees for best novelette, with some links to the stories, and in the case of "Ray of Light", an excerpt. Here's a list of this year's five Hugo nominees for best short story, with links to the stories. We complete the first round of the Spring 2012 Battle of the Books with Throne of the Crescent Moon by Saladin Ahmed vs. Revealing Eden by Victoria Foyt. The winner will be the book I most want to continue reading after 25 pages. Throne of the Crescent Moon: DAW hardcover, February 2012, 274 pages, cover art by Jason Chan. Saladin Ahmed is a new writer who has already made a big splash, with a Nebula nomination for his short story "Hooves and the Hovel of Abdel Jameela" and two Campbell Award nominations for best new writer. 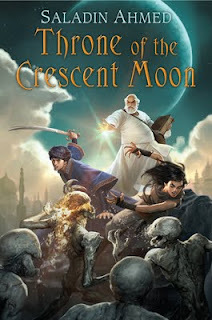 Throne of the Crescent Moon is his first novel, and it has been getting a lot of buzz, prompting us to name it one of our four "seeded" books in this bracket. Throne of the Crescent Moon is medieval fantasy set in an Arabic society, described believably by Saladin Ahmed, a Muslim Arab-American. Our protagonist, Doctor Adoulla Makhslood, is the last ghul hunter in the great city of Dhamsawaat. He knows he's getting too old, tired, and fat to continue to tangle with supernatural creatures, but no successor has stepped up to relieve him of the duty, although at least he has the help of his small but lethally quick assistant Raseed. The first 25 pages mention a conflict between the ruling Khalif and a rebel called the Falcon Prince, and we also learn of murders committed by ghuls summoned by an unknown sorcerer. Revealing Eden: Sand Dollar hardcover, January 2012, 307 pages, cover art by Matthew Desotell. Victoria Hoyt is an actress and screenwriter, who has starred in such films as Last Summer in the Hamptons and Déjà Vu, usually working with her husband, director Henry Jaglom. Her first novel was the young adult fantasy/mystery The Virtual Life of Lexie Diamoond, published by HarperCollins. 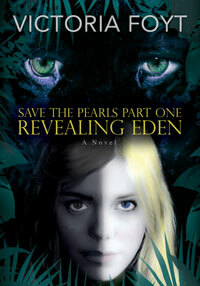 Revealing Eden joins the trendy sub-genre of young adult post-apocalyptic science fiction. Severe global warming has driven everyone underground. Due to the effects of radiation, caucasians ("Pearls") die young, while dark-skinned "Coals" dominate society. Our heroine Eden is six months away from turning 18, and if she hasn't found a husband by then, she will be killed. She is set on attracting a black mate, but "Pearls" are regarded as ugly, and only one "Coal" has shown the slightest interest in her, Jamal, the security guard in the research facility where she works. The Battle: I can't hold the suspense going for this one. Throne of the Crescent Moon has a very impressive opening, while Revealing Eden has a lot of problems. Starting with the good news, after 25 pages it is already clear that Throne of the Crescent Moon combines a distinctive setting with nicely developed characters and a strong narrative voice. Our aging protagonist is clearly flawed yet instantly likeable. I've mentioned in previous Battle of the Books posts how traditional high fantasy novels typically had a straightforward good-against-evil conflict, while current fantasies usually have more shades of gray. In Throne of the Crescent Moon, Saladin Ahmed bucks the trend——his good guys are very good and his bad guys extremely bad. Here's how he gets away with it: the characters aren't good or evil just because they've been assigned that role. There are reasons for their behaviors; something is at stake for them. The bad guys are cruel because they need to be. In this universe, dark magic works through causing others to suffer. And our hero is brave and valiant in his defense of his kingdom, despite his low opinion of their Khalif, because he knows if the kingdom falls he'll no longer be able to find a decent cup of tea. For long-time science fiction readers, the premise of Revealing Eden——people survive catastrophe underground, and blacks come to dominate society while whites are subjugated——will immediately call to mind Robert Heinlein's Farnham's Freehold. Revealing Eden suffers greatly in comparison. For one thing, Heinlein gave a believable reason for the societal shift: the superpowers nearly annihilated each other in nuclear war, leaving a power vacuum for Africans to fill. Foyt is offering a similar cautionary tale about climate change, but it makes no sense. People of color are in control and live much longer because of global warming? How could melanin conceivably make such a huge difference, especially if everybody lives underground? Even if there were a scientific basis for that, it is counterintuitive enough to demand explanation, or at least some hand-waving, in a science fiction novel. And while we're trying to figure that out, why on earth does this society demand, on penalty of death, that you marry by 18? At one point, we are told it's because everyone must "contribute to the continuation of our species," but I should think an underground society would be more worried about holding the birthrate down; indeed, in another passage we learn that no one is allowed to have more than one child. Plenty of small details similarly don't ring true. For example, Eden bemoans the fact that her hair is brittle from the black coating she puts on it every couple of days to try to fit in. So this is a society in which everyone has a personal holoprojector, but they've forgotten the concept of hair dye? All these strained details are there to set up Foyt's examination of race relations. But when Robert Heinlein showed a society dominated by people of African ancestry in 1964, he was challenging his readers to consider the bigotry of their own society. Foyt's purpose is similar here: depicting a cruel ruling black class to show her white readers how awful it is to be subjected to discrimination——I assume that's her purpose, because I can't think of any other purpose that wouldn't be highly distasteful——but today, that story concept feels outdated and much too simplistic. In 2012, even addressing young readers, surely there are better ways of conveying the importance of diversity and tolerance than by showing people of color all being mean and nasty to the white characters. How about, for example, presenting an interesting society with a different culture and ethnic mix from ours? Saladin Ahmed has done that in Throne of the Crescent Moon, in the context of what promises to be a compelling story. Throne of the Crescent Moon advances to the second round, to meet The Man from Primrose Lane by James Renner. Ahmed and Renner are already talking smack on Twitter, so you don't want to miss that one. Our penultimate first round match of the Spring 2012 Battle of the Books pits The Man from Primrose Lane by James Renner against Blood Ocean by Weston Ochse. As always, the book I most want to continue reading after the first 25 pages will advance. 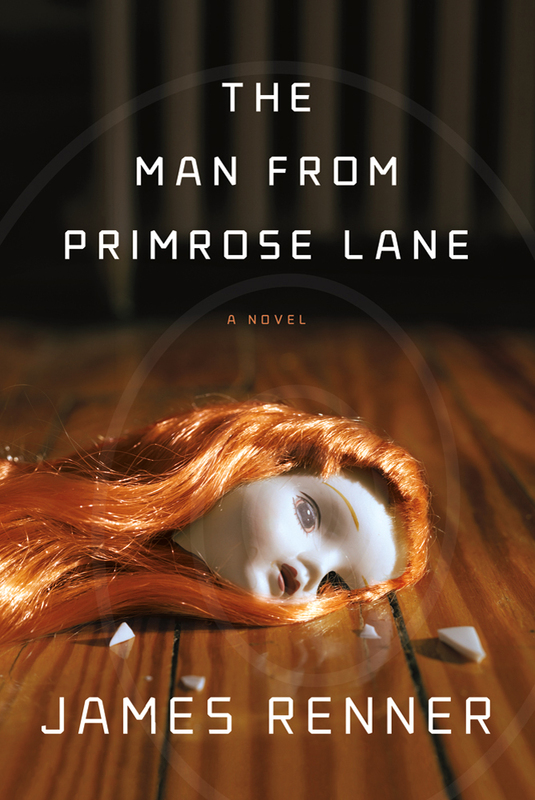 The Man from Primrose Lane starts out as a mystery, about a crime writer investigating the murder of the eponymous character, an odd recluse who wore a different pair of mittens every day, no matter the weather. The book has various autobiographical elements: the protagonist David Neff is a crime writer who went to Kent State as James Renner did, and the title of his last novel, The Serial Killer's Protégé, is suspiciously close to Renner's. I believe and hope the similarities end there, as David Neff is a single father, still reeling from his wife's suicide. In the opening 25 pages, his editor tries to draw him out of his funk by interesting him in the case of the murder of the strange man from Primrose Lane. This has been promoted as a cross-genre book, but there have not yet been any fantastic elements through 25 pages. Blood Ocean: Abaddon trade paperback, February 2012, 286 pages, cover art by Luke Preece. Weston Ochse is a former Army intelligence officer, who won the Stoker Award for best first novel for Scarecrow Gods in 2005, and has twice more been nominated for his short fiction. He has published by my count seven novels, another seven novellas or chapbooks, and three collections of short fiction——most recently Multiplex Fandango, with introduction by Joe R. Lansdale. (Some of his books were published in limited editions and will take some effort to find.) Ochse is married to author Yvonne Navarro. Blood Ocean is part of Abaddon Books' Afterblight Chronicles shared universe, set in a future world devastated by plague, where petty tyrants vie for power over the survivors. Blood Ocean is set among a floating community of survivors, who created a makeshift city by tying together their ships and boats. In the first 25 pages, we meet our protagonist Kavika Kamalani, one of the Hawaiian descendants on the floating city. Kavika is a prospective member of the Pali Boys, a group of men who seek out danger, based on their philosophy to "live large." The leader of the Pali Boys assigns Kavika the job of solving the murder of another Pali Boy, who was "blood raped," killed to harvest his blood. The Battle: Both these books have solid openings, and I'm enjoying them both. Although I've been promised genre elements, the opening chapters of The Man from Primrose Lane are straight mystery. I said in our last battle that a mystery novel has to give me something more than the whodunit to hold my interest. Renner meets that challenge with some nicely quirky aspects to the story, starting with the oddball victim with the ever-changing mittens, and with very engaging characterization, which makes me want to keep reading even if I don't much care who committed the crime. 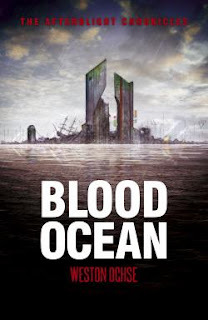 The first thing to say about Blood Ocean is that, even though there are at least ten prior books in the Afterblight Chronicles, this does not read like the umpteenth entry in a shared world series. Ochse has made this future his own by taking the tale out onto the water. The setting may put you in mind of Snow Crash or the film Water World, but there is no "formula" feel to the story. I am interested in the politics of this floating city, and in the culture of the Pali Boys. There are also some nice touches, such as a literal rendering of the phrase "monkey on your back." It's hard to guess which of these books I would enjoy more if I read them both all the way through. But my decision comes down to two small distinctions. First, the opening chapters beg for comparison——both books open by introducing the central mystery of an unusual murder in which the victim bleeds to death, through the viewpoint of a character who is not the book's protagonist——and I preferred the set-up in Renner's novel. The first chapter of Blood Ocean shows the Pali Boy who is going to be the victim, but we don't get much sense of his personality. The most interesting thing we learn about him is that he's a Pali Boy, one of a group of Hawaiians who revel in dangerous stunts, especially swinging through the air on the ropes and cables of the ships comprising the floating city. But this chapter all takes place on the deck of a couple of the ships. This seems to me a wasted opportunity to start the story more memorably and exuberantly, in the air over the floating city. "Next time someone tells you to wait outside, you think you might listen?" The second distinction is that Renner's novel strikes me as a bit more ambitious. Renner starts with an interesting mystery and a terribly traumatized character, and hints that the mystery and the protagonist will tie together in strange and intriguing ways. 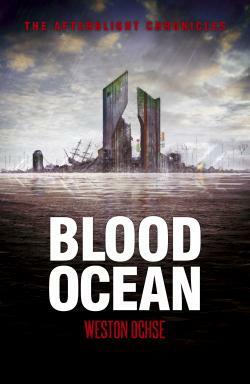 I think there is a higher ceiling to this book than Blood Ocean, in part simply because post-apocalyptic stories have been done pretty thoroughly in recent years. Even though Ochse has added some nice twists, I suspect Blood Ocean is less likely to develop into a contender to win this bracket of the Battle of the Books than The Man from Primrose Lane. Still, I am looking forward to reading more from Weston Ochse, perhaps starting with the audiobook of last year's Velvet Dogma. 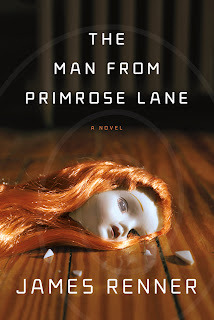 The Man from Primrose Lane moves into the second round, where it will take on either Throne of the Crescent Moon by Saladin Ahmed or Revealing Eden by Victoria Foyt.